I’m about to tell you something that might come as a bit of a surprise. So brace yourself….OK. Here goes: the 4th of July is in 13 days. Really, 13 days! Can you even believe that? It kind of snuck up on us this year, right? I feel like June just started, so to be thinking about the 4th of July already sounds like crazy talk. But nonetheless, it’s almost here. I was actually browsing on Pinterest the other night (shocking, I know) and found some amazing ideas for 4th of July parties, BBQ’s, and decor. Seriously, I got pulled into looking at 4th of July decor for a good hour at least. Anyway, I thought it would be fun to round up my favorites and share them with you today! 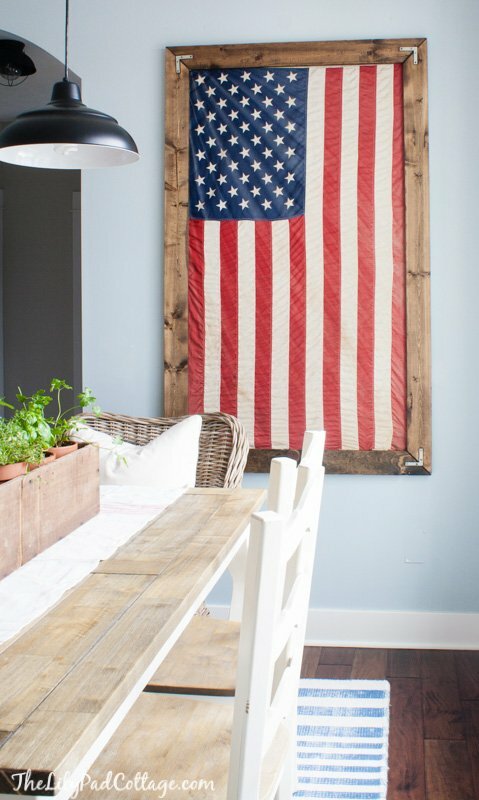 So that’s what I have for you lovely folks: simple 4th of July decor ideas with farmhouse style. Got a red coke crate sitting around? 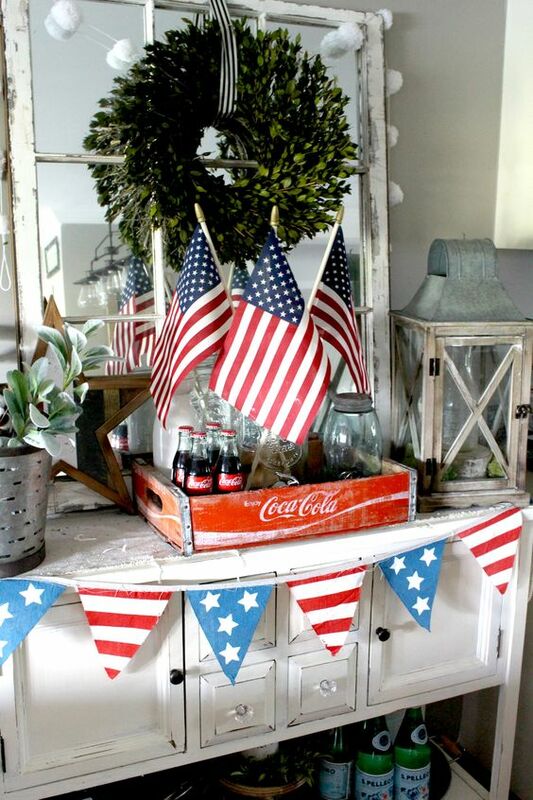 Pull it out and use it for a cute 4th of July inspired beverage station like this one from The Glam Farmhouse! 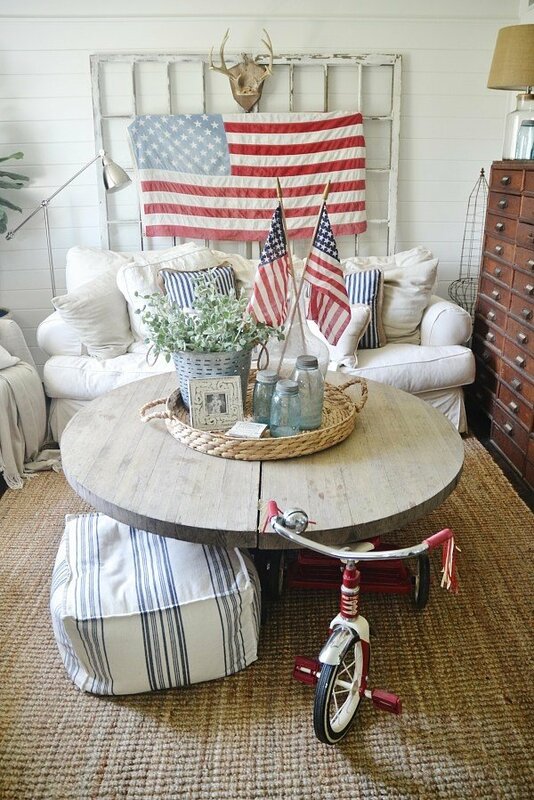 I’m pretty sure we can all agree that everything is absolutely perfect in this 4th of July living room from Liz Marie Blog. 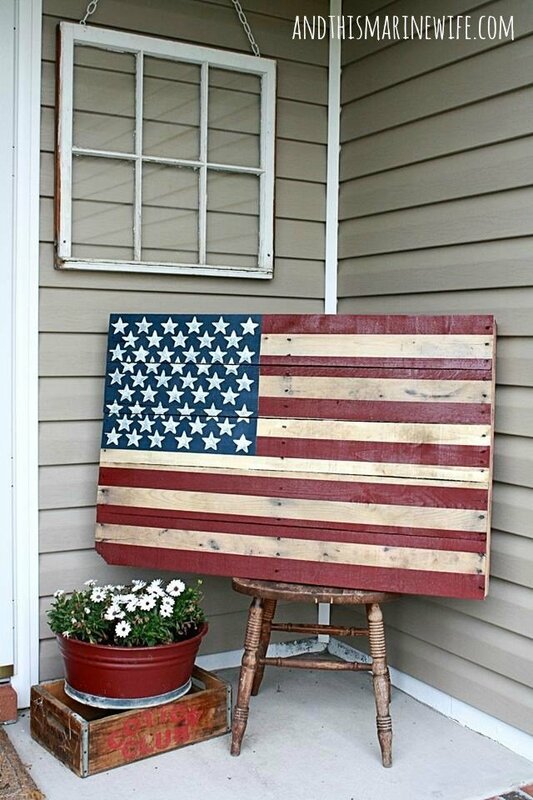 How stinkin’ cute is this front porch and that DIY American flag pallet board? I love this idea and you can find the detailed tutorial from And This Marine Wife. 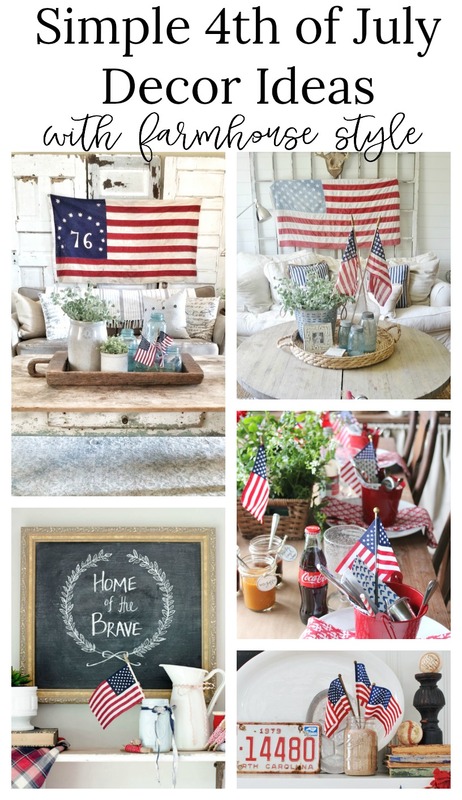 Just take a minute to soak in all the details of the 4th of July table from Talk of the House. Seriously? This is magazine-worthy folks. 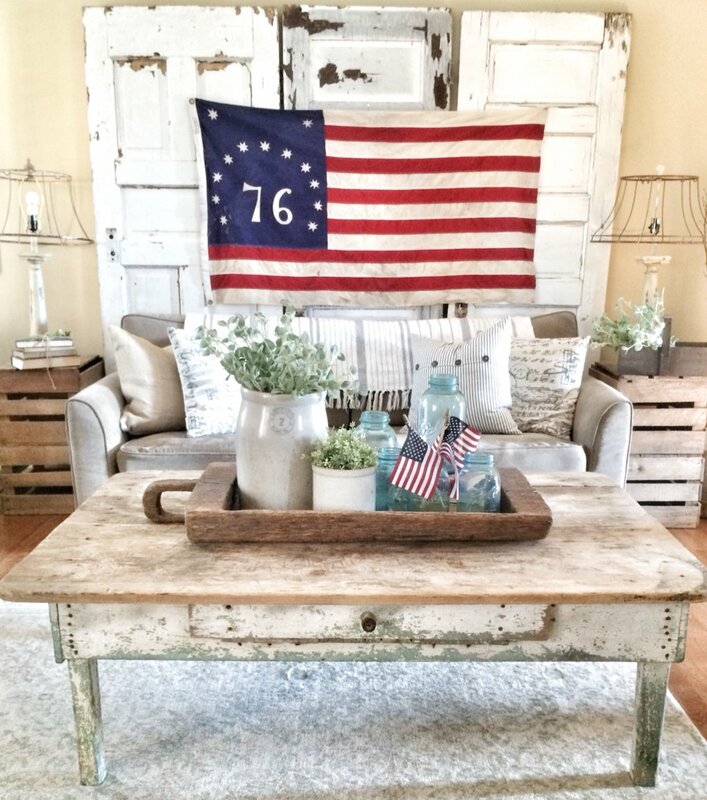 Sometimes all you need is an old flag and a rustic wooden frame. I adore the simplicity of this from The Lilypad Cottage. Tt’s truly stunning. This 4th of July mantel from Hunt and Host is the perfect combination of vintage charm and patriotic decor. I love the old license plate and little flags in the mason jar full of sand. Very creative! You can probably imagine that I’m smitten with everything in this photo. The old doors, chippy white table, vintage lamps. Oh and of course the simple touches of patriotic decor. Perfectly done! From Bless This Nest Blog. 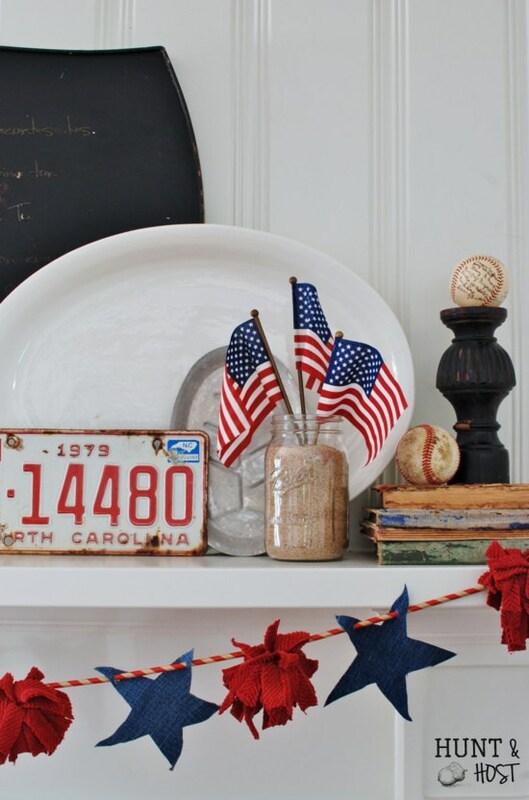 A few pops of red, white, and blue give this vignette a simple and charming 4th of July look. And that chalkboard is perfectly done! See more from the Golden Sycamore. 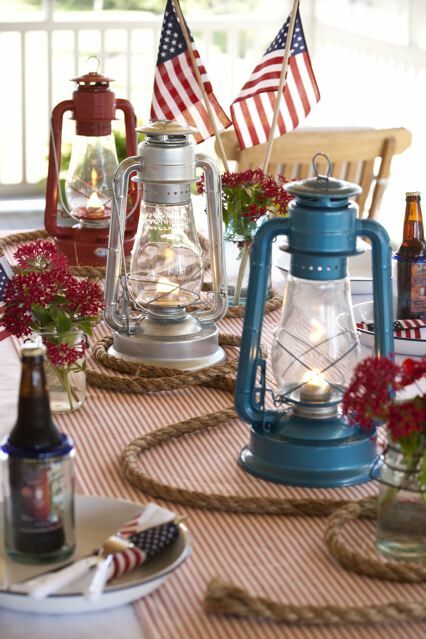 Red, white, and blue hurricane lamps, a bit of rope, and a red ticking runner make for a super creative and vintage inspired 4th of July table. Easy and simple idea from Your Cozy Home. 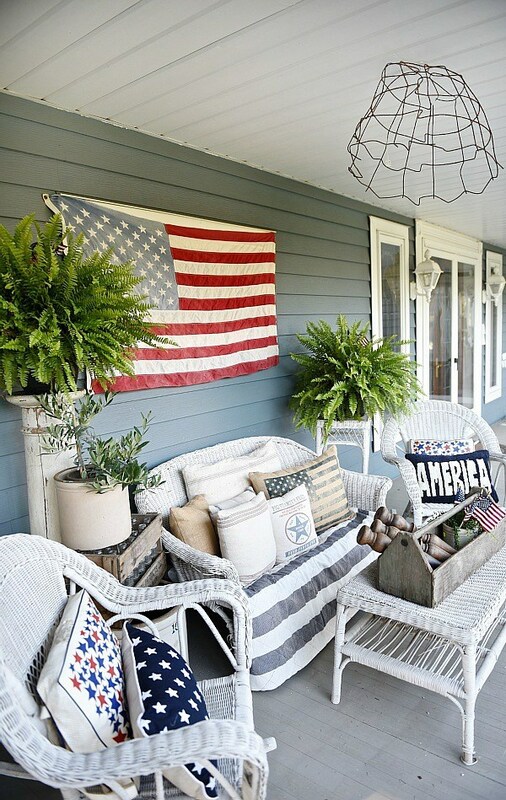 Lastly I have to end with this perfect farmhouse porch all decked out for the 4th of July. Don’t you just want to sit here all afternoon with a cold glass of sweet tea? I sure do. This gorgeousness is from Liz Marie Blog. I absolutely love the 4th of July. Not only are we celebrating this amazing country we’re so blessed to call home, but it falls in the middle of summer, which we all know is truly the most wonderful time of year. Yes, it’s true. Nod along with me. Fireworks, good food, sunshine. It just can’t be beat. And it’s definitely worth celebrating. 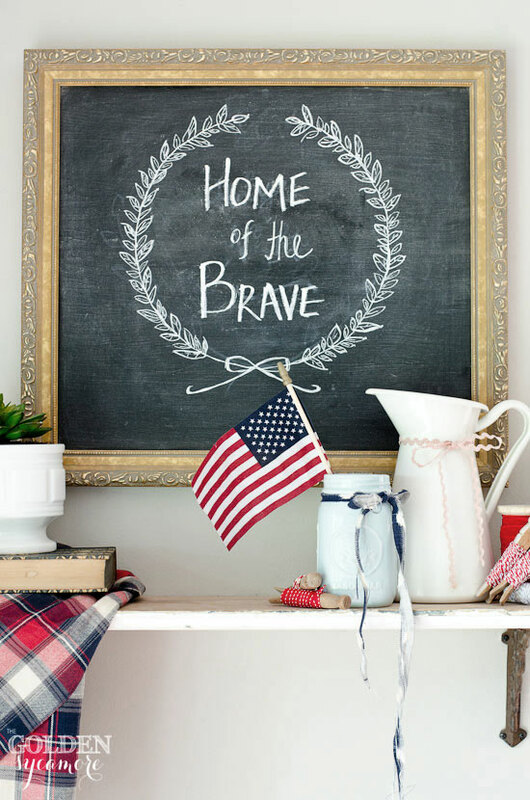 I hope this little roundup gave you some fun decorating ideas and inspired you to get a little patriotic with your decor. Remember you only have 13 days, so you better hustle your bustle. What a fun post . 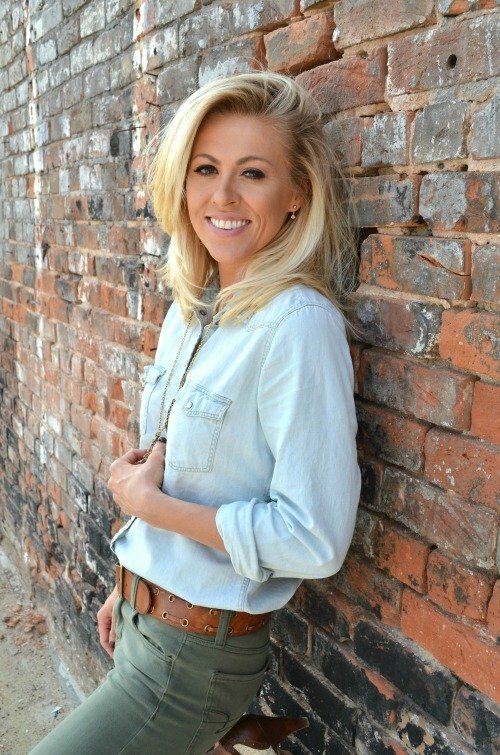 I’ve spent the last hour “getting lost” going from blog to blog -thanks for sharing it …. three cheers for the red white and blue ! Oh I do that too Marilyn! Most of the time I’d rather read blogs and look at Pinterest than watch TV. 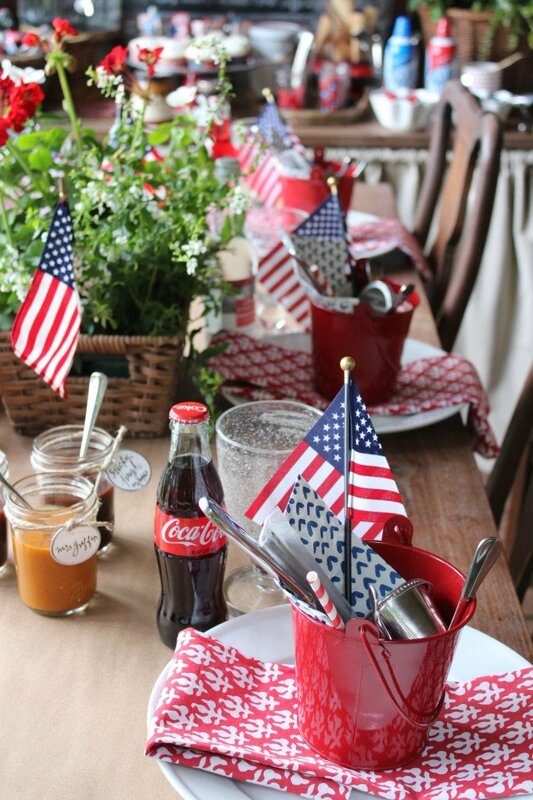 I normally don’t decorate for the 4th, but after seeing these cute ideas I think I will! I don’t do much 4th of July decorating either Nikki, but all these ideas make me want to grab a few flags and do something! Maybe an easy 4th mantel look? Great ideas table settings. Way too hot in Phx to be outside daytime. After dark little lights misters and a pool. Oh Ellen, I’ve been seeing those crazy temps in AZ. Bless your heart, I would be melting! How nice and patriotic not to mention colorful. Thanks for sharing.